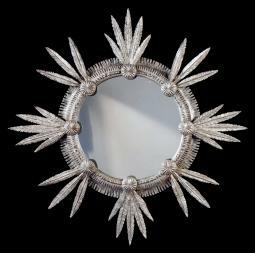 This fanciful mirror is a burst of symbols from the Indian traditions of the Great West. A ring of fringed and beaded rawhide is encompassed by a headdress of feathers clasped by conchas. The frame is leafed in sterling silver. The design is centered by a convex mirror – bright like the sun and round like a council circle or kiva, gathering in all that surrounds it. As seen in Domino Magazine. Next Post:#0036 Sunburst 48″ diam.